Nicole signed up for the 2015 Junior Iditarod this morning at the annual volunteer picnic and musher sign-up at the Iditarod Headquarters in Wasilla. She was the first musher to sign up for the race that takes place the last weekend of February. The Junior Iditarod is a 150-mile race that runs along a portion of the original Iditarod trail, leaving from Knik Lake and finishing at the Willow Community Center. Nicole ran the race last year as a rookie and was the red lantern winner. This year she will be racing for the last time as a junior and the last big race before she heads off to college at the University of Alaska-Southeast to study marine biology. Nicole has a large pool of up-and-coming pups to choose from for this year’s race. She hopes to have last year’s leaders on her team, Aussie and Sidney. Training starts for the dogs in late August. If you would like to become part of the team, you can be our entry fee sponsor, you can sponsor a dog on the team, and if you are up in Alaska and would like to learn more about mushing and drive you own team, you can do that too! Here in the land of the midnight sun, the mosquitos are out and the dogs are enjoying their vacation. They spend their days lounging around in the barking lot and wishing for the colder days when training will start again. We are truly in the dog days of summer here at Team Ineka. That does not mean that nothing is happening, the mushers are busy running triathlons, working their summer jobs, fishing for salmon that they will use for trail snacks and backyard BBQ’s, plenty of chores to be had, dog houses to build and kennels and fencing to be installed, bees to attended too and cord wood to be stacked. We are already planning our season. Robert will attempt (once again) to do his Iditarod qualifiers IF the snow comes and none are cancelled like they have been for the last two seasons. Nicole will run the Junior Iditarod for the last time before she heads off to college in the fall of 2015, Michele plans to enter a small race or two and our friend Dale will too. We are always looking for people to be a part of the team too! You can learn more about our incredible athletes, the mushers and our daily life with 40 sled dogs. You can sponsor a dog, booties or become a race entry sponsor, or help with the daily kennel needs with your generous contributions. It takes a small army to get to the starting line. Our sponsors and supporters are not just people that donate money, goods or services to us. They are part of the team. We appreciate your support and look forward to new partnerships. Our sponsors receive letters and pictures directly from your favorite mushers. You have the opportunity to meet the team at race events and if you are up in Alaska we can teach you how to drive your own dog team. The mushers are always willing to travel to speak to our sponsors and supporters and to school and other groups that would like to learn more about living a life with dogs! If you would like to find out more, comment below or check out our sponsorship page by clicking the button below. Nicole ran the Junior Iditarod in February as a rookie and finished with a team of 10 happy dogs lead by Sidney and superstar stand out, Aussie! As Nicole’s dad and armchair musher for this race, this re-cap will be a little different than most. It does include an excellent 60 minute interview with Nicole talking about her race on The Sibe Vibe show hosted by Dorothy Wills-Raftery. You can listen to the show by clicking on the link at the bottom of this post. 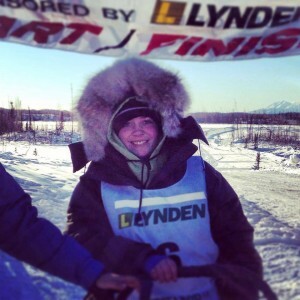 Nicole started training for this race more than a year ago after she finished the Willow Junior 100 and decided that she wanted to run the biggest junior race in the world, the Junior Iditarod. Nicole was the first musher to sign up in October and was given a generous donation by Alaska Chicks, Co. to pay for her entry free. As many of you know, we had a crazy winter here in Alaska. Just a little bit of snow in December then a huge warm up and a big melt in January. After I ran a few of the sprint races in late January we let the dogs have a couple weeks off to gain some weight and relax a bit as we geared up towards race day. We waited for a couple weeks before the Junior Iditarod folks would make a formal decision on the race and the trail. Finally, about a week before they said that the race would leave from Martin Buser’s Happy Trails Kennel in Big Lake, follow through the swamps to the river past Scary Tree and up to Yentna, have the kids do a 10-hour lay over and return. The week before the big race is always crazy! First we had to drop off Nicole’s drop bags so that they could be flown to the checkpoint at Yentna Station. 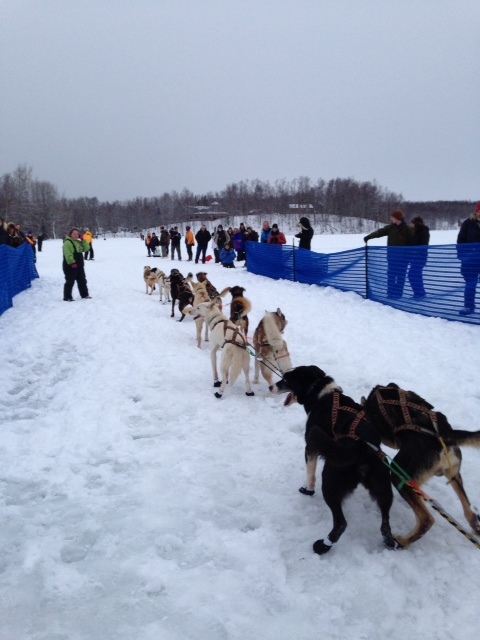 Each musher was allowed two drop bags that weighed no more than 60 pounds. Each drop bag would contain everything that Nicole would need at the checkpoint and the return trip back. They included things like kibble and meat for the dogs, meat and salmon snacks, extra dog booties and batteries for Nicole’s headlamp, food for her and a few extra supplies. 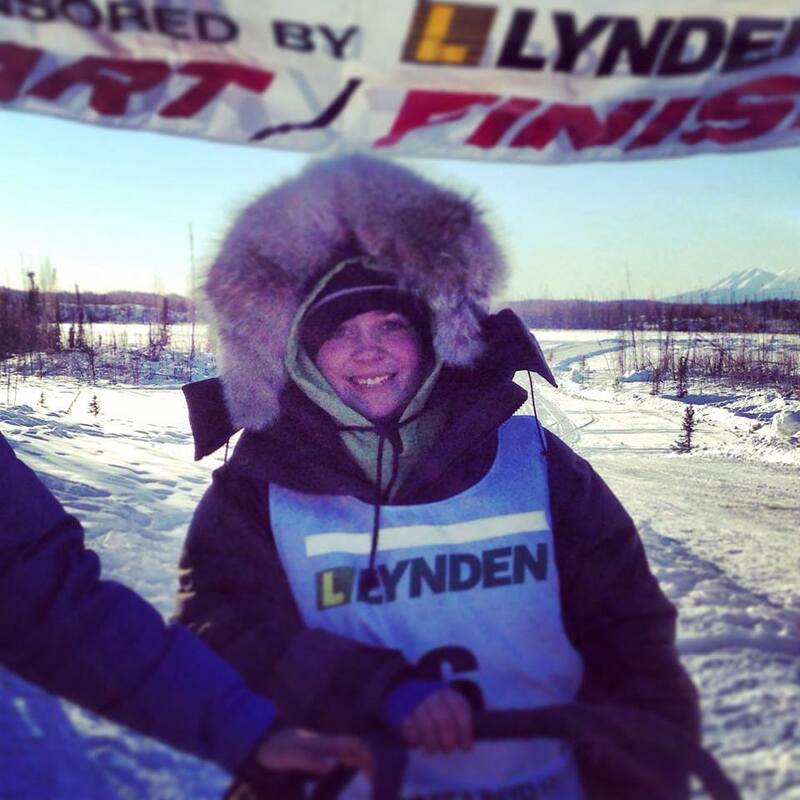 On Thursday night Nicole had her rookie musher meeting at Iditarod Headquarters in Wasilla. It was very informative. Iditarod veteran Cim Smyth talking about feeding and snacking on the trail, another Iditarod veteran Zack Steer talked about dressing for cold weather, many others spoke about vet care, sled repair, the trail, and more. On Friday morning we had to arrive before noon back at Iditarod Headquarters for the Vet Check. All the dogs looked good and passed the check except the vets told us to make sure that we gave the dogs a nail trim before the race. Friday night was the musher meeting. Nicole, Michele and I attended and heard about all the formalities of the race and the bib draw took place. Since Nicole was the first musher to sign up she was the first to draw. She picked number 6. She would be going out in the middle of the pack. Race day is always organized chaos. We had all of Nicoles gear and sled packed up the night before. We loaded up the team and headed over to Happy Trails by 8:00. We had to be there by 9:00. Nicole was going out 6th so we knew we had a little over two hours before her race started. They parked us down on the lake and we got started with our pre-race chores: dropping the dogs from the truck, putting on the tags for each dog, prepping Nicole’s sled, a talk with the veterinarian, many pictures from fans, and much, much more. As we began to hook up it was my job to lead the team out to the starting line by holding on to the leaders. Dale was near the front as was several other volunteer handlers as we made our way across the lake ice to the starting line. Michele was already there to take some pictures as they counted down to the start of Nicoles race! Nicole and her team were off shortly after 11:15 and on the trail. The team looked good as they rounded the first turn and then she was out of sight. For us armchair mushers, the first time for me with Nicole in a big race, it was now a waiting game. The Junior Iditarod was testing out a new tracking system that would be used by the big race, the Iditarod, in a couple weeks. Each team is given two trackers, actually emergency locator beacons or SPOTS. They not only have the ability to track the teams on the trail but should the musher have an emergency they can push a button on the tracker and help would be on their way. But, if a musher pushes the button they are withdrawn from the race. Sure enough she was. Over the last several hours Nicole was pretty much keeping pace with the middle of the pack. As the hours wore on she fell into last place but she was keeping and even speed of about 7.8 miles an hour. The average speed of our dogs, many of them Iditarod and Yukon Quest veterans who’s speed is much more deliberate and they set themselves into a comfortable pace. Nicole arrived to Yentna station close to 7:00 to begin her 10 hour mandatory layover. She was a couple hours behind the musher in front of her but to Nicole she didn’t mind. She started her chores and even got a few hours rest before leaving in the early morning darkness heading toward the finish. The reports from the trail said that her dogs looked great and so did she and she left without any problems. Nicole would tell us later that she mushed along the river with the Northern Lights swirling above her. What a sight! I woke up at 5:30 and the first thing I did was check on Nicole’s status of her tracker on my iPad. She was allowed to leave at about 4:50. I saw that she was moving down the river and went back to sleep until about 7:30. After the morning chores and meeting with a dog training client at our house, we left to head to Big Lake at about 11:30. We arrived by 12:15 and could see by the tracker that she was still several hours away. We alternated between sitting in the truck and the visitors center at Happy Trails to get updates on Nicole. When she was five miles out we all started getting anxious and headed out to the finish line. What was so cool was that everybody that was still at the visitors center came out to cheer Nicole in. Nicole made it up the hill and crossed the finish line a little after 3:30. After all the formalities were done: she had to check in, make sure all of her mandatory gear was there and a quick pat on the head for each of the dogs, I went up and gave her a hug and told her great job! We lead the team over to the truck and Nicole gave them a quick salmon snack. I looked over the dogs and so did the vet. While they were tired, there were no injuries at all! That is a testament to good dog care out on the trail by Nicole. We packed up the gear and loaded up the team and headed for home. Nicole grabbed a quick shower while Michele and I put the dogs back at their houses. By our schedule that we came up before the race, we thought that Nicole would arrive just in time for the banquet. She made it with a couple hours to spare! The banquet was held at the Willow Community Center at 6 pm after the race. It was a packed house and all the mushers got to sit front and center. The guest speaker was Iditarod veteran, Mike Williams, Sr. He talked about the importance of mushing and preserving our way of life and the junior mushers becoming a mentor for someone else. He also performed the invocation in both his native language and in English. It was a very moving experience. After dinner, the awards ceremony started. Each musher received a large amount of goods and services donated by local businesses. Nicole received her Red Lantern award and thanked me when she spoke to the crowd. I was so proud of her at that moment I started crying. 4.) Sometimes keeping your attitude happy and exciting is the best for the dogs. If you think you can’t make it the dogs will feel that energy and they will just quit on you. Nicole says that she will be back next year to run the Junior Iditarod and remember that thing about mentoring that Mike Williams talked about at the banquet? Well, it is in the works that Nicole will be mentoring a young lady from Canada and they will run the race together next year! A huge thank you to Nicole’s sponsors and supporters for this race. Not only were your donations much appreciated but your kind words, advice and support that helped make all of this possible: Alaska Chicks, Co. The Upholstery Gallery, Ed and Judy Perry, April Cox, James Wheeler, Bob Morgan, Jeff Rogers, Hugh Neff, David Scheer, our awesome vet Susan Dent and many other family and friends that cheered for Nicole along the trail and to the finish line. On January 4th I was on Knik Lake prepared to run in a 200 mile qualifier on some of the most historic trails in mushing. The trails that the great Joe Redington ran on and where the Iditarod once started. One can say that the pieces are what make up a whole. And this weekend’s race experience is true testament to that! This post is in no way complaining. I learned a lot and I am glad that we entered the race. A good friend of mine, Dave Scheer, always says, “there’s no shortcut to Nome.” Boy, is that the truth. On Friday, the night before the race, our electricity at the house was out for more than 13 hours. True it was out for most of Willow, but when you depend on an electric well pump to feed your dogs it compounds the problem just a bit. Our drop bags were due at the Eaglequest Lodge and we were told in our musher packet that if we wanted one bag to stay at Eaglequest then mark it as such. I did and the other one was headed to Yentna Station, some 100 miles down the trail. I met Michele for a quick dinner and then we headed over to the pre-race musher/handler meeting at the Menard Center. What was supposed to be a quick meeting turned into a two hour affair of mostly banter between the trail boss and the mushers trying to figure out the trail. After all of this back-and-forth it was time for the musher draw for starting position. Since I was second to sign up, I was second to pick. I would be going out 15th (out of 41 teams) just behind my good friend Hugh Neff and defending 2012 Knik 200 champ Jake Berkowitz. I was happy with my starting position. Pretty much right in the middle of the pack. We got home about 10 pm just as my daughter, Nicole was finishing up the nightly kennel chores. She was awesome and really stepped up by melting snow on the wood stove so that the dogs could be fed. The electric finally came on about this time. We all headed to bed as we would be up early to get loaded up and on the lake by 9. We were up by 6am and the dogs were fed, the team and gear was loaded and we were on the road by 7:30. We were one of the first teams to arrive and were told to park on the close end of the lake on the south side. Shortly after we got all of our gear unpacked and on the ground, the Race Marshall came over and told us and another team that we were parked in the wrong spot and we had to move. Great! Luckily we were moving just about 50 yards away and it was a better spot for our launch into the starting chute. About this time, Dale, one of our biggest sponsors, good friend, and someone we are teaching how to run dogs showed up to give us a hand. The race was supposed to start at 11:00am. Leaving 15th, I should be on the starting line at 11:30 sharp. It wasn’t until 10:30 that the volunteers finally came around for gear checks and to attach a Spot Tracker to the my sled. About this time the chief veterinarian came over and looked at the team. He expressed concern about a couple of the dogs being thin and I agreed with him. Aussie and Trapper have a hard time keeping on weight and we feed them like crazy. I just hoped that these two wouldn’t be a problem down the trail. About this time Michele and I were getting ready to feed the team a beef snack. As we were taking them out of the package, Burton, the youngest dog on the team and in his first race jumped up and grabbed the snack out of my hand. As he did he got my ring finger on my right hand and it immediately started bleeding profusely through my glove. Of course we didn’t have any first aid supplies so Michele ran across the lake jumped into her car and ran to the gas station to buy some Band-Aids. By the time she made it back we were five minutes from the first team going out and 20 minutes before I was to leave. Blood was all over everything at this point: my parka, my sweatshirt, a couple of the dogs and my sled bag. The cut was pretty deep and I could have used a stitch or two. We wrapped it as best as we could with some gauze and medical tape and I put on two pairs of knit gloves. We headed to the starting line. Nicole and Dale lead the team out and Michele was on the runners with me. at 11:30 she kissed me good bye and off we went on the trail! The trail off the lake winds through houses and dog yards as well as the Mushing Hall of Fame and the Redington homestead before reaching a few lakes and some rolling hills on the way to the Nome Sign. Our first 25 miles on the trail was un-eventful and just a few teams passed us. The trail was well marked and well groomed. I knew this trail well from the Goose Bay 150 and the Nome 40 race last season. At the Nome Sign we turned right heading into the Big Swamp on our way to Willow and the first checkpoint, Eaglequest Lodge. Then before we hit the swamp there were a few hills to contend with and by this time people were beginning to snack their teams. One of my biggest problems in racing, and it comes from lack of experience of my team comes from when mushers snack their teams on the trail with kibble. My dogs immediately stop almost every time to gorge on the left overs and usually a tangle ensues. The Big Swamp trail was punchy, slow, and not very well marked. It was beginning to get very warm and I would later find out it was almost 40 degrees. way too hot to be running a race with my team who is used to running at night and much colder temperatures. I could immediately tell when we came upon the trails that are maintained by the Willow Trails Committee. They were well groomed and well marked. As we headed into the Willow Swamp Loop we had to first run parallel to the Nancy Creek Recreation Area. This section of the trail was the most fun of the race with several switch backs, ice bridges and up and over a few up and down hills. As we came into the Willow Swamp it was now dark and I could see the familiar sight of the flashing red lights that were near the checkpoint. The dogs were running very good. We had stopped a couple times to snack with beef and salmon. I arrived at the checkpoint at about 6:30 as the snow began to fall. Nicole and Michele were there to cheer me on and Michele was able to snap a quick picture and wished me luck. I had planned to stop here for a couple hours and feed the dogs. We were lead to the airstrip about a quarter mile from the lodge. I parked my team, took off their booties, gave them a quick rub down and walked with my cooler to the lodge to grab my drop bag and some hot water. I grabbed the water and looked all over for my drop bag. It was not there! Only the Knik 100 drop bags were there. My bag, that I clearly indicated to stay at Eaglequest was taken 50 miles down the trail to Yentna Station. Great. I added two packages of fish and a package of beef snacks to the water and let it soak for about 45 minutes. I fed the dogs, bootied them up and was back on the trail at exactly 8:30 on the way to the halfway point on the Yentna River. I have run this trail many times. My dogs knew it like it was their home trail and I had no problems making my way down the river. It was snowing pretty good by this time and by the time we saw the sign that we were 10 miles from Yentna Station I knew we were making decent time. We arrived at Yentna about 1:30. Just about a five hour run for 45 miles. That is, what, about 9 miles and hour? Not bad. We were told to park right behind another team, whom I would later learn was Jamaican Musher Newton Marshall and parked next to me was Tim Osmar. I thought to myself, man we are all parked pretty close together and what happens if a team that is parked behind me wants to leave before I did? I was told that I could leave a 7:55 am. This was a mandatory 6 hour stop plus time differential. I had planned to stay about 8 hours but with the team directly behind me I knew I would have to leave at my appointed time. Over the next several hours I melted snow in the cooker, fed the dogs a good meal and tended to my chores. All the dogs looked good except I could tell they were tired. We ran close to 100 miles with about an hour and a half rest. I was proud of them. Nobody in the team had any injuries, and all their feet looked good. About 5:00 am I had just finished heating up some soup for myself and I laid down in some straw and covered my head with my parka. It was snowing very hard by now and we got at least 3 inches of wet snow through the night. I headed to the warming hut at 6:30 and talked for a bit to the volunteers. It sounded like several people had taken wrong turns and three had scratched so far. By 7:00 I had given my dogs a snack, and prepared to leave at 7:55. Booties were on the dogs that needed them and we hit the trail right on time. The sunrise was slow as we worked our way down river and the snow eventually stopped around 10:30. Several teams passed me but we were making decent time. As we reached Corral Hill coming into Eaglequest, Scarlet started hesitating and her tug went slack. I knew she was tired. She is the oldest dog on the team, 9 years old, and by far the smallest. I knew I was going to drop her at Eaglequest. We made it to the checkpoint at 12:30, a little faster than the run the night before. I planned to camp here again for a couple hours but the volunteer said that they were wrapping up the checkpoint. I signed in and out and dropped Scarlet and asked the vet to call Michele to pick her up. A few miles after we left Eaglequest I began seeing teams camped out along the trail in the Willow Swamp. I found a spot to pull over and gave the dogs a snack. I could tell the dogs were pretty tired. We stayed about 25 minutes and hit the trail. As we were running through Nancy Creek Recreation Area Trapper started to limp. I stopped the team. It looked like a sore shoulder. This is were the proverbial wheels fell off and our race was coming to an end. I couldn’t get Trapper to stay in the bag, he had never been in there before, and I decided to have him sit on the drag. Shortly thereafter the team got slower and slower and I began to see them pulling over to the side to want to rest. This is exactly what happened last year on the Tustumena 200 and I knew that they need to rest. We pulled off the trail, somewhere in the middle of the Big Swamp and I let them rest. They looked exhausted. They could barely keep their eyes open. It was about 3:30pm and the sun was beginning to set. I fired up the cooker and used my last bit of fuel and made the dogs a meal. Trapper’s sore shoulder was not getting any better. I massaged it and placed a heat wrap on it. After the meal I walked him around and he was still limping pretty bad. Trapper is the biggest dog in the team, weighing at least 65 pounds. At about 5:30 I got the dogs up and tried to get them going. They didn’t want to budge. We would go for a half mile and they would want to lay down again. The scariest thing in mushing is your team quitting on you. I switched every dog around trying to get them to go down the trail. Nobody wanted to lead. I knew that at least four teams were behind me and it would be several hours before I saw anyone because they couldn’t leave Yentna till at least 10:30 plus a four to five hour run up the river and then here. I knew I was at least 25 miles from the finish and ahead of me was the punchy trail of the Big Swamp and the big hills after the Nome sign. I decided I would turn around. The trail back to Eaglequest was relatively flat and groomed. But if I turned around my race would be over and I would have to scratch. Even after turning around the team didn’t want to go. I finally fashioned a leash out of necklines and hooked it up to the first section of the gang line behind the leaders and started walking back to Willow. Trapper was in the sled bag at this time and I had tied my sleeping bag and dog coats (which I shouldn’t have brought because it was so hot) to the top of my sled using extra necklines. I walked for more than two hours. My feet were soaking wet by this time from all the overflow on the river and sweat and I had developed pretty bad blisters by this time. “I have to scratch,” I said. We ran all the way back to Eaglequest, slow, but we were moving and made it in at about 9:30. There was nobody there with the race and I knocked on the door to the lodge. I called Michele, told her where I was and what happened. She and Nicole were already at Knik Lake waiting for me to finish. It took them almost an hour to bring the truck to Eaglequest. While I waited for her I spent time with each dog and gave them a hug and told them I was proud of them. They had no idea we didn’t finish. They were just happy to be done, I think. All the dogs seem to be injury free and Trapper even seemed to be getting better. He was walking around without much of a limp at all as we waited for Michele and Nicole. Michele and Nicole finally arrived and we loaded up the team and the gear. We had to drive all the way back to Knik to get Michele’s car. We handed off my Spot Tracker and officially scratched on the lake. We were home by 12:30. 37 hours after I started. We put the dogs back at their houses and headed to bed. I awoke Monday morning frustrated and wanting to throw in the towel on the season. I spoke to my friends Hugh and Tim on Facebook and they encouraged me to not give up. Many of my fans on our Facebook page said the same thing. I decided I would think about it over the next couple days and decide what I was going to do. As I always do after a training run and a race I debrief and try to figure out what I learned on the trail. 1. There is a saying in sports: Race as you train and train as you race. This was my biggest downfall on the Knik. I was suffering from a major case of kennel blindness. I thought my dogs were ready. We had plenty of miles, over 500 in December alone and lots of time on the sled. But all but one run was on our home trails. Any dog will perform if it knows where it is and how far it is from home. 2. My dogs were underweight. I could tell that immediately when I saw some of the other teams on the trail. This is another case of kennel blindness. When you see the same dogs every day they look the same each day. You seldom notice if a dog loses a few pounds when they are in a group of 30 where they have lost a few pounds too. I don’t know what am doing wrong on my feeding schedule. I thought I was doing what everyone else was doing. We were and are feeding an appropriate amount of kibble and meat. 3. I did not give my dogs enough rest. I should have stayed at Yentna for 10 hours. It’s what they needed. Instead I let others influence my trail schedule. One of the biggest mistakes in mushing. 4. I should not have trusted the race crew to keep my drop bag at Eaglequest. By doing so I did not feed my team properly on my outbound stop at Eaglequest. 5. At some point on the trail I lost my Nalgene water bottle. I did not hydrate my body enough and I knew I was getting dehydrated. 6. I should have let the team rest on the Big Swamp for at least 4 hours instead of trying to coax them to go. In hindsight if I would have done that my team probably could have finished even with Trapper in the sled. 7. I was carrying way too much gear. I should not have brought along the dog coats, my parka and I should have worn different boots. 8. It was way too hot to run this race. I know my team does not perform well in temperatures over 30 degrees. Any team, mine especially does best when it is minus 20 degrees or below. 9. I probably should have withdrawn when Burton bit my finger. While I was able to use my hand, I did lose quite a bit of blood. I am so proud of my dogs. They gained experience on the trail. Burton really became a sled dog on this run. I am proud of Denali. Just a couple weeks ago he had been getting laser treatments for a sore back and during this race he didn’t show one sign of soreness. Even though we didn’t finish we ran over 200 miles over the weekend. I had so much support from my family, friends and fans. Their words of encouragement were so uplifting. This weekend we are going to run a fun sprint race with some of our fastest dogs and then concentrate on Nicole’s races in February, the Willow Junior 100 and the Junior Iditarod. I plan to also run the Goose Bay 150, our little Independence Mine race and the Don Bowers 300 (if it happens) in March. I don’t know if we will meet our original goal of qualifying for the Iditarod this year or not. If we don’t our plan is to travel to the Lower 48 next season and run in some of the races down there that have been on my mushing bucket list for a long time: The Race to the Sky, The Beargrease, and the UP200. Anyone want to be a handler?? True we have spent hundreds of thousands of dollars to get where we are today, including buying our home here but, do you know what? I am proud of where we are. We are a family run kennel that works hard and we love what we do. We are not rich and we don’t have big name sponsors but that’s okay. To some people they are just sled dogs but to us our dogs are our friends. We do what ever we can to provide for our team. We are not done for a long shot. See you on the trail and see you in February! Our first Children’s book, A Musher’s Dream: Team Ineka, is now available. The book tells the story of Team Ineka and the journey north to Alaska to train a team of Huskies to one day run in the Iditarod. With wonderful illustrations this book will spark your child’s imagination and bring up conversations of American history. The book will make a wonderful gift. If you would like to order a copy please click on the link below. I had the privilege of reading a copy of “A Musher’s Dream,Team Ineka,” by Robert and Michele Forto and found it a delightful little book. The illustrations capture your heart and the story of how the spirit of Ineka, the much-beloved husky who passed on before the Fortos realized their Iditarod dream—but who nevertheless continues to inspire it and watch over the progress of the new dogs who joined their household and mushing team—is simply touching. This wonderful book is geared towards children but I certainly enjoyed it!!! A story about Team Ineka and their dream to run the Iditarod… I do have a personal interest in it as it stars two dogs that came from my kennel… I believe in you Robert Forto and can’t wait for the ending to happen in real life!!!! Then the sequel – Coming into NOME!!! I loved your book “A Musher’s Dream Team Ineka” The story is interesting and the illustrations are wonderful. I read to my grandson of 14months old and he engaged with the pictures (we did a shortened version due to his short baby attention span) He loved pointing at the husky pictures. I think this is a great book for a younger child as a pre- chapter book. Thank you for sharing your experience through the story. It engaged us from an illustrated point and from the story line. I recommend this to all my friends with dog loving kids. Take Care!